Dukovany Nuclear Power Plant firefighters take full advantage of the modern GINA intervention system, which, in addition to IRS, is used by international UN and other humanitarian organizations in more than 30 countries. 2. 4. 2019 4 min. GINA provides key information about the route, places and intervention objects before they arrive, significantly reducing the time of arrival and eventual intervention. By using the pan-European rescue system, it has strengthened its technical equipment not only to fulfill its primary tasks in the power plant, but also to the inhabitants of its region. Nuclear power plants have traditionally been one of the most advanced and efficient devices in terms of electricity generation and technology. At the same time, they are subject to the highest demands for reliability and safety of operation. Their equipment is therefore continuously upgraded during operation using new technologies and methods. The same maintenance principle as production equipment goes through all traffic and security segments. A direct part of nuclear power plants is usually also a unit of professional firefighters. Their overriding task is possible rapid and effective intervention and also fire prevention in the power plant. In Dukovany 64 professional firefighters (in four shifts) are in continuous operation and thanks to the location of the power plant they provide their professional assistance in the surrounding villages in the South Moravian Region and the Vysočina Region if necessary. Newly they started to use the intervention system for easier coordination of intervening units. "When assessing and selecting a suitable system, we put the emphasis on 100% reliability, the extent of available information, connection to the system of Firefighters of the Czech Republic as well as experience and operation abroad." Tomáš Richter, the commander of the Fire Rescue Service of the Dukovany NPP. Gina intervention systém is tested since June and now is used in full operation. 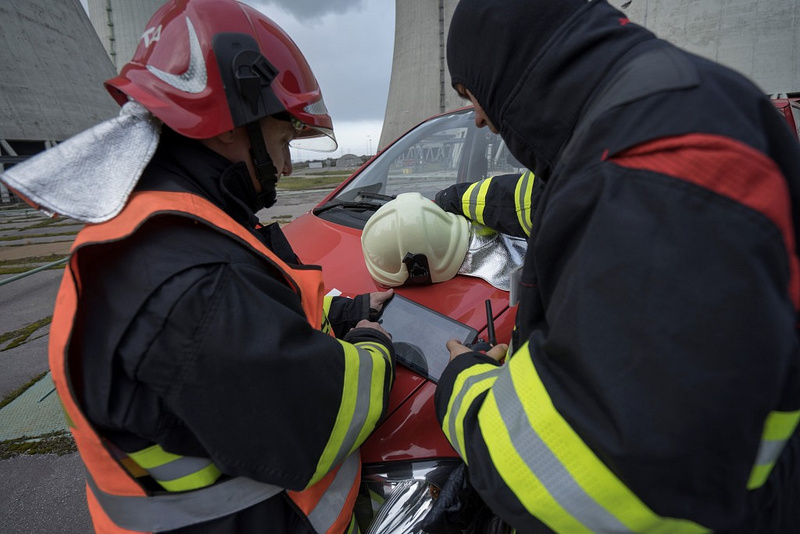 Firefighters now see in the tablet, for example, the place of intervention, what happened on the spot, contact the notifier or sent out IRS units, such as the Police of the Czech Republic or emergency medical services. Thanks to a sophisticated data layer system, firefighters can operate a data warehouse of object information around the plant. The information is then automatically recorded in the necessary databases of the nuclear power plant and the fire brigade. For example photos and videos taken from a tablet on the scene of the intervention, which are automatically saved and are immediately available for further use and analysis, for example for the unit commander and the Operations Center of the Fire Rescue Service of the Czech Republic. "Emergency cars and technical equipment in the equipment of the Dukovany Nuclear Power Plant were completely modernized within the so-called stress-testing measures and expanded to include heavy machinery to deal with the consequences of extreme climatic influences" Roman Havlín, Director of Security. Only this year Dukovany's firefighters, together with regional units, intervened in 20 interventions (fires and road accidents) in the area and carried out 143 technical assistance at the power plant site.